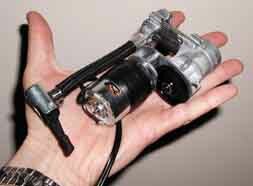 After a number of ideas, I found a perfect little electric 12V pump to take on the trip. A friend of mine found a cheap pump at Harbor Freight and dismantled it. After seeing it, I bought one as well. The product as sold is quite big, but after stripping the plastic bits, shortening the air hose and power cable, a much different unit emerges. As you can see, it easily fits in the palm of my hand. It weighs very little. A quick test showed that we could pump an empty motorcycle tire to 32 PSI in about 3 minutes with this "modified" version. Total cost was US$11.